Five days of hiking and fishing in the Ruby Mountains of Nevada had only awakened my appetite. 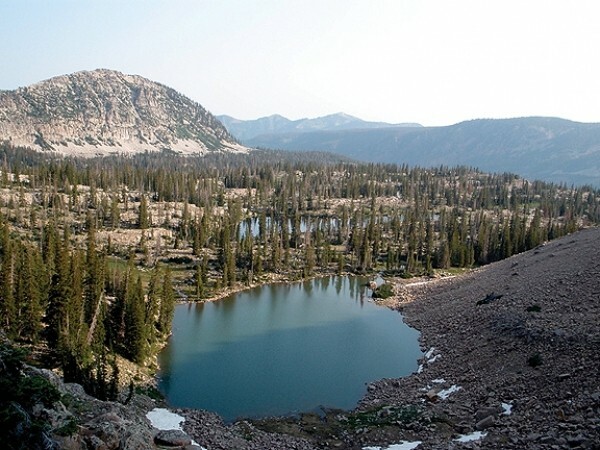 A day after returning to Salt Lake City from an early July backpacking trip, my partner and I loaded our fishing rods—one for fly fishing, two for bait fishing—along with bait, tackle, reels and two dogs into the Subaru and headed for the Uinta Mountains. The sky was clear as we drove east, but we were running late. Not that we worried about having enough time in the mountains, as close as they were; it was the weather that concerned us. At 9:30 a.m., clouds were already gathering in the west, portending the same afternoon downpour that had been arriving like clockwork over the Rockies for the previous two days. But in no time, we sailed over Parley’s Summit, and the gray-white cumulus buildup seemed to fall behind us. A quick jaunt over the hill from Park City took us to Kamas, then on to the Mirror Lake Highway, where we began our ascent into the cool lodgepole pine and subalpine fir slopes of the high Uintas. The Mirror Lake Highway is almost unarguably the easiest, quickest access to the forest for those of us from the west side of the mountains, but it is not the only access. The Uintas stretch north close to Evanston, Wyo., and east to Vernal. Accessing more distant trailheads can take a full day, but anything along the Mirror Lake Highway is a simple day trip that could, if one wishes, turn into something longer. Wanting to keep my trip short and simple, I researched my options in High Uintas Backcountry of Utah: A Guide & Pictoral, written by Utah natives Jeffrey and Brad Probst. Nearly 20 years old but not outdated, the book led me, a Beehive State native with embarrassingly little firsthand knowledge of the Uintas, to the Divide Lakes. Only a 27-mile drive up the Mirror Lake Highway and a 2 1/2 mile hike from the Crystal Lake trailhead, it promised to be a simple day trip. Our party of dogs and humans hit the trail just before noon—with a little delay backtracking to a roadside kiosk to buy a $6 Forest Service permit, valid for three days. We hit the trail heading to Island Lake, but within a few hundred feet turned right onto a spur trail marked “Cliff Lake.” My partner and I hike fast, even uphill. Passing a half-dozen groups—and almost as many little lakes—along the way, we reached the Divide Lakes in a little more than 30 minutes. Although the parking lot had been crowded, we found no one else at our destination. The Divide Lakes are funny little things, shallow and muddy. Though only a stone’s throw from one another, they flow into different drainages—one emptying its waters into the Provo River, the other into the Weber River. Our guidebook promised a “nice population of smallish brook trout,” and suggested fly-fishing. Not much with a fly reel, I took the bait pole and loaded it with a double-whammy: chartreuse PowerBait with a pink salmon egg on top. My partner fixed up the fly. Two hours later, after a sitting out a pre-storm that loosed a few fat drops, the serious clouds started gathering from the west. We still hadn’t caught any fish—not so much as a nibble, though the tug of weeds had tricked me more than once. We risked one last cast and, with still no success, packed up the gear as fast as we could and headed down the trail. The storm continued rolling in overhead, rumbling as we half ran for the parking lot, once again passing groups as they, too, turned to leave. The dogs ran ahead of us, alternately frightened by the sounds of the storm and thrilled by the jaunt in the woods. I also felt the thrill of a day in the woods. It didn’t matter that I had no fish to show for it.